Wash and then pat the turkey breast dry with paper towel. In small bowl, mix the garlic, basil, and pepper to make a rub. Apply to meat. In a shallow seal-able container, mix together the oil, soy sauce, lemon juice and sugar to make a marinade. Place turkey breast in the container and toss to coat. Refrigerate for at least four hours, turning occasionally. Heat your grill and turn to low. Place the turkey breast on the grill, close lid, and cook to an internal temperature of 165 degrees or until juices run clear – about 15 minutes per side depending on the size of the breast and the temperature of the grill. 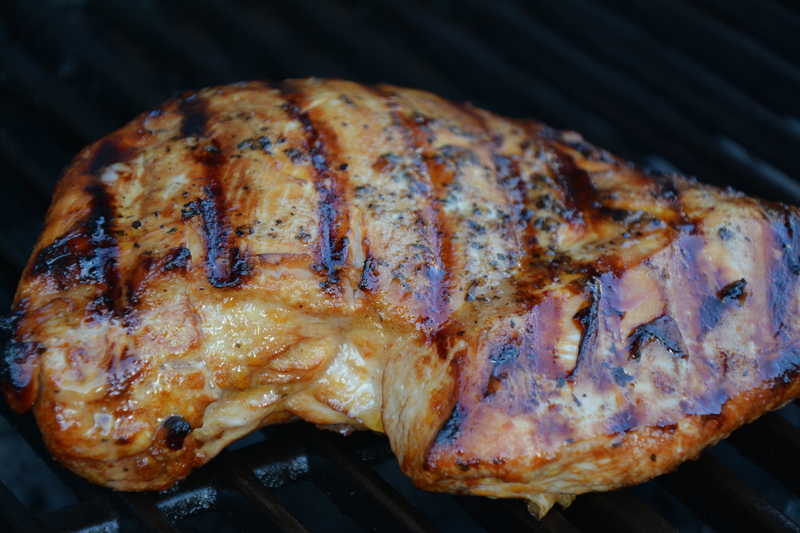 This turkey breast has a slight teriyaki flavour. Serve with grilled or stir fried vegetables, jasmine rice, or with gf and me’s roasted potatoes. Photo Credit: gf and me 2013. This entry was posted in Lunch and Dinner, Recipes and tagged BBQ recipes, GF, gluten free in Red Deer, how to cook a boneless, marinated turkey breast, skinless turkey breast, teriyaki turkey breast. Bookmark the permalink. Awesome, this has to be delicious. Pinning this and posting to FB! You would like it. We’ll make it for you someday soon! Really want to try the panini…sound very yummy! That’s a good looking piece of meat there.